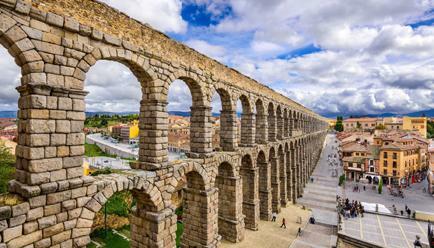 Historic and modern at the same time, Spain is a cultural beauty with unmatched energy. 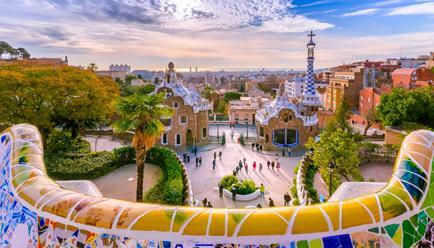 This 6-night escapade takes you through Barcelona and Madrid, which are absolute gems of Europe. 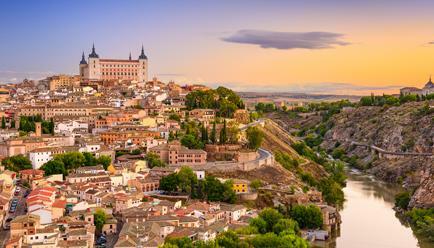 With half-day tours to Montserrat and Toledo included, this package will give you the true taste of the Spanish culture and heritage. Day 1: Arrive in Barcelona. Enjoy a cosy overnight stay at the hotel. Day 2: Explore the beautiful heritage of Barcelona. Later in the evening indulge in some cultural and culinary treats. Day 3: Discover the rocky mountains of Montserrat and enjoy some handmade liquor. Day 4: Arrive in Madrid. Travel in style with private transfers from your Barcelona hotel to Barcelona airport and Madrid airport to your Madrid hotel. 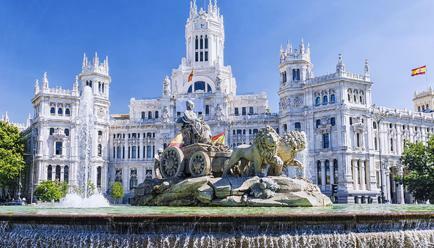 Day 5: Enjoy a historic tour of the Spanish capital - Madrid. 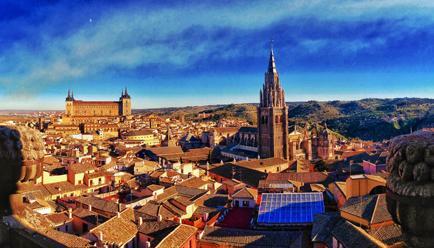 Day 7: Bid Adieu to Spain! The Location: A Sumptuous Melange of Heritage & Hedonistic Delight! 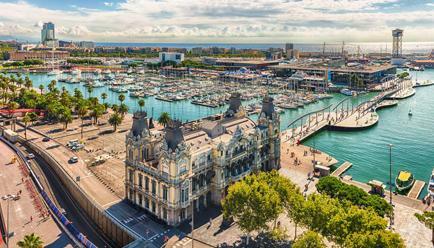 Barcelona: The capital of the Catalonia region of Spain, Barcelona is well-known for its Gaudí buildings, Gothic Quarters and enriched culture. The city offers one the chance to soak into its whimsical architectural wonders, traditional wine and vibrant lifestyle, welcoming everyone with open arms. 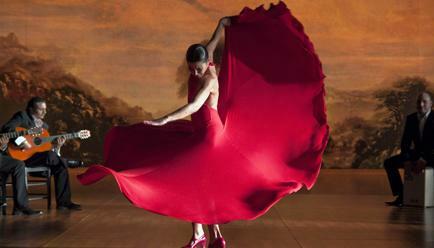 If fun and Flamenco are what you fancy, there’s no place better than Barcelona. 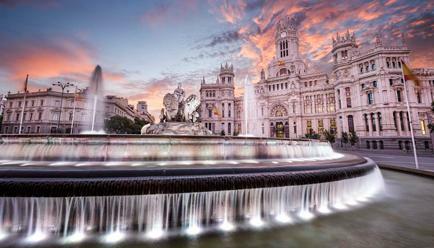 Madrid: Whether you love the big city life, are a football fanatic or an art enthusiast, Madrid has a host of experiences in store for you. 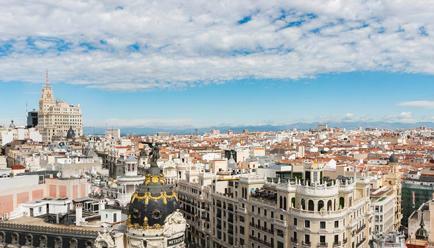 With museums boasting of works by celebrated artists like Francisco Goya and Diego Velázquez, Madrid has an unparalleled art scene and rich heritage. 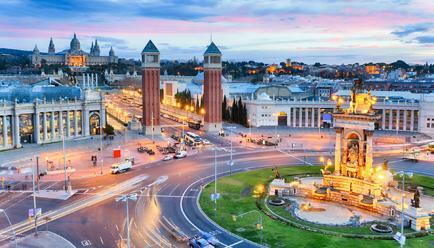 Arrive in Barcelona and get a private transfer to your hotel. 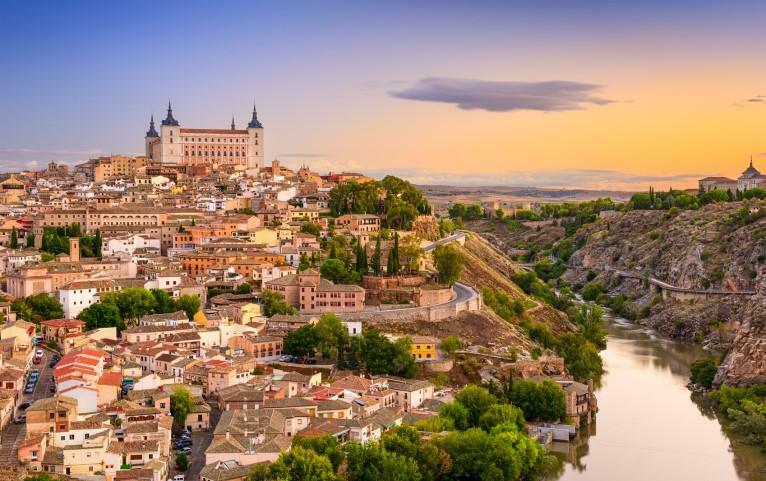 Have a day to yourself and explore the city the way you like, go on a Tapas tour, do some ice-cream tasting, sip on some Sangria or get some retail therapy, the choice is yours. At the end of the day, enjoy a cosy night at the hotel. Arrive at the presentation terminal (Address: Carrer de Balmes, 5) at 8:00 AM (pick-up from hotel to the presentation terminal not included). The tour starts at 8:15 AM. Start off with a guided walking tour through the Gothic Quarters, the oldest part of the city. Visit Las Ramblas, the Cathedral Square, The Cathedral, the Old Jewish Quarter and other interesting places. 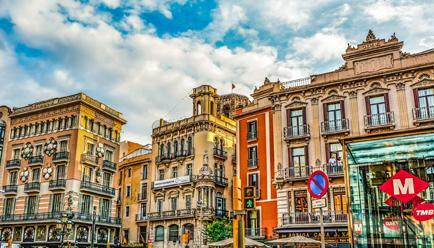 Take a panoramic bus tour of rest of the city passing through the Passeig de Gràcia Street housing Casa Batlló, Casa Milà la Pedrera, the Triumph Arc, the Olympic Village and the Olympic Port. Next head to the Montjuï c Mountain and Montjuï c Castle. Head to the Espanya Square to visit the magical fountains, twin Venetian Towers, the MNAC and the shopping centre Las Arenas. Head back to the city centre and arrive at Catalunya Square. The tour ends in front of the Hard Rock Café (return transfers to the hotel not included). 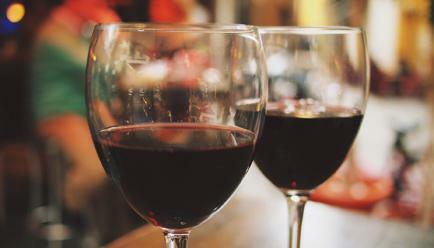 Later in the evening, arrive at the Tablao Cordobes (Address: Ramblas, 35) at 7.30 PM to enjoy a buffet dinner serving Spanish specialities, coffee and wine. At 9:00 PM attend a Flamenco show accompanied by a glass of cava (Spanish Wine). Transfers to and from the hotel not included. Arrive at the presentation terminal (Address: Carrer de Balmes, 5) at 9:00 AM (pick-up from hotel to the presentation terminal not included). The tour starts at 9:15 AM. Start off with a ride to Montserrat. Upon arrival get introduced to the history of the Santa María de Montserrat monastery and take a guided tour through the monastery. You also get to taste 4 types of typical liquors handmade by the monks. After the guided tour you get a chance to explore Montserrat on your own. There’s much to do at Montserrat - you can explore La Moreneta, attend an Escolania concert, head to the museum (10% off on entry ticket), visit the Espai Audiovisual Montserrat exhibition (free entry included), take a Sant Joan or Santa Cova funicular tour (20% off on the Sant Joan funicular ticket), go on a hike or sample the local cuisine (10% off at the Mirador dels Apòstols buffet restaurant). Head to the arrival terminal at Barcelona (Address: Carrer de Balmes, 5). End of tour (return transfers to the hotel from arrival terminal not included). Day 4: From One Spanish City to Another! Arrive in Madrid from Barcelona. Travel in style with private transfers from your Barcelona hotel to Barcelona airport and Madrid airport to your Madrid hotel. Explore Madrid on your own and have some me time. Head to the hotel for your beauty sleep. Arrive at the presentation terminal (Address: Calle San Nicolás, 15) at 8:45 AM (pick-up from hotel to the presentation terminal not included). The tour starts at 9:00 AM. Start off the tour by heading to the Plaza de Oriente and visiting the Temple of Debod. Head to Plaza Mayor to visit la Plaza de Villa and Puerta del Sol. 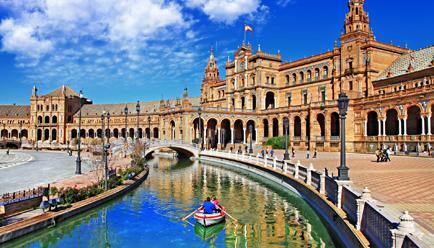 Visit the Carrera de San Jerónimo street, Las Cortes (Spanish Parliament), Neptuno’s Square, Paseo del Prado (walk of art: Thyssen, Prado & Reina Sofia Museums), Atocha Railway Station, Royal Botanic Gardens of Madrid, Cibeles Square, Alcalá street, Alcalá’s gate, Plaza de Toros de Las Ventas. Head to the Santiago Bernabéu Stadium, Paseo de la Castellana street, Plaza de Colón (Columbus Square), National Library, Gran Vía street, Plaza de España, Plaza de Oriente. End of tour (return transfers to the hotel from arrival terminal not included). Please note that the itinerary is subject to change due to events and celebrations in the city. Arrive at the presentation terminal (Address: Calle San Nicolás, 15) at 8:30 AM (pick-up from hotel to the presentation terminal not included). The tour starts at 8:45 AM. Start off with a ride to Toledo. 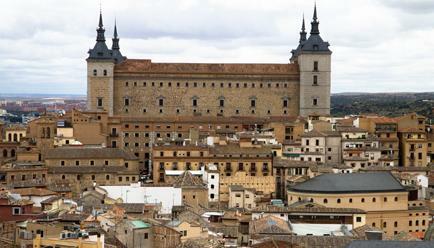 At Toledo visit the exteriors of the Cathedral and then head to visit the interiors of the St. Tomé Church (free entry included), Synagogue of Santa María la Blanca (free entry included) and monastery of San Juan de los Reyes (free entry included). Attend a demonstration of the Damascened technique and forging of swords. Indulge in some retail therapy if you please. Head to a panoramic viewpoint to get a picturesque view of the city and get some great pictures of the same. 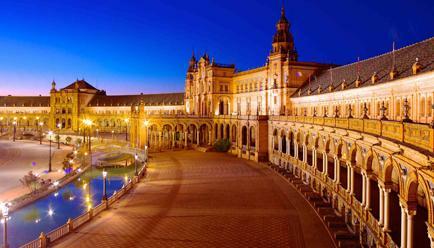 Head to the arrival terminal at Madrid (Address: Plaza de Oriente). End of tour (return transfers to the hotel from arrival terminal not included). Get a private transfer for your departure from Madrid. Reach the Madrid airport and head back home rejuvenated from an exciting trip. Package Cancellation Policy: Any cancellation will incur a full payment. A no-show on the day of arrival will also incur charges equivalent to a full package. Shared transportation: You will be escorted from one marvel to another in the comfort of a shared vehicle. Make sure you enjoy the scenic drives and don’t miss out on the several photo-ops along the way! 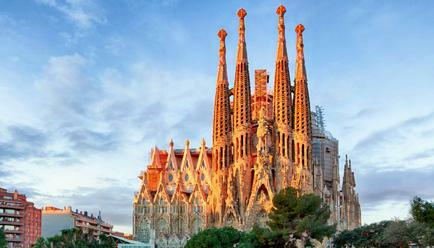 Your 7-day tour of Spain begins in Barcelona. One-stop flights for Barcelona are available from all major cities of India.